McCullough argues that hands are all about skilled learning – an underrated form of knowledge developed out of habit and practice. It’s a physical and experiential knowledge, found in actions like drawing or typing. In these moments, particularly when the hand is the tool of the mind to create forms of art like drawings, paintings or written works, it becomes clear that the two are connected. He also discussed the deskilling that has taken place as a result of the advancement of technology (ex: data entry jobs). With the advent of TUIs like the iPad, the pendulum has begun to swing in the opposite direction. 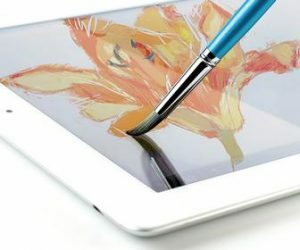 The connection between mind and hand has been reestablished to allow skilled actions and processes (like drawing with one’s finger or the Apple Pencil), thereby transforming its surface into a digital piece of canvas. The goal of such devices, evidenced in their iconography, naming conventions and app designs, is to replicate the real world in a digital environment. Given these affordances and new UIs, the hand has once again become a necessary and skillful tool.